The Life Light can turn a window into a phototherapy system. When fall begins to pass into the short days and long nights of winter, millions of people will slide into a depression known as seasonal affective disorder (SAD). They’ll have difficulty sleeping, they’ll feel lethargic and irritable, and they’ll suffer weight gain as they begin craving starchy and sweet foods. Since the primary cause of SAD is thought to be reduced serotonin levels in the brain—a reaction to the reduction in sunlight—the conventional therapy has been for sufferers to sit in front of a bank of fluorescent white lights that mimic sunlight. As effective as this treatment can be, it’s just not an enjoyable experience for the person being treated. A team of Massachusetts high-school students has come with an invention that could be even more effective because it feels less artificial. Micah Reid, a last-year student at Nuvu speciality school in Cambridge, Mass., battles SAD every winter, but she's avoided phototherapy because it felt unnatural. So Reid and a team of fellow students created the Life Light, a phototherapy light that looks like a normal window covering. “We wanted it to be beautiful and convenient,” Reid said of her team's effort, which included fellow NuVu students Andy Kreiss and Maia Levitt. 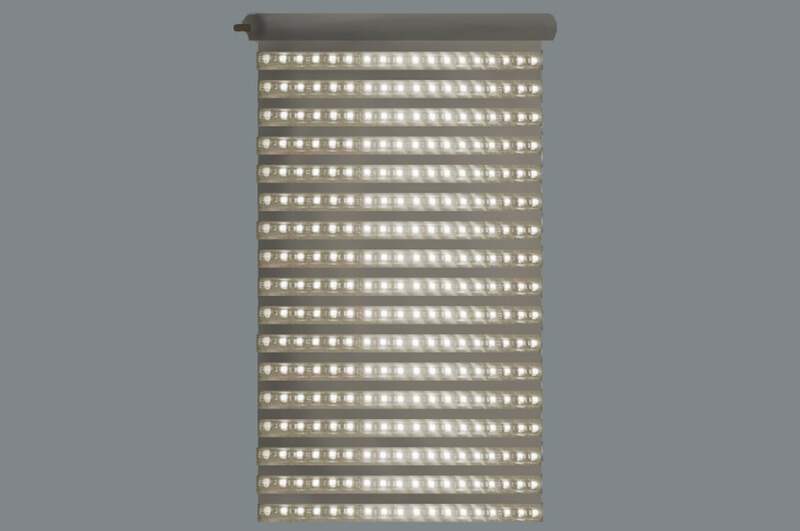 Reid describes conventional phototherapy lights as “small, bright, and ugly.” Life Light consists of a motor-controlled roll-up window shade with rows of LEDs attached to it. A sheer drape in front of the shade helps diffuse the light, making it look more like natural sunlight coming through a window. This artist's rendering of the LifeLight shows how rows of LEDs would be attached to a roll-up shade. “It’s a visual placebo,” Reid said, adding that her team spent two weeks alone choosing just the right fabrics to create the most natural feel. A mobile app turns the LEDs on and off and rolls the shade up and down. Users can also program the app to dim the therapy light and to create on/off schedules. Team member Andy Kreiss told us that the LEDs are set to clinical phototherapy levels by default. But as Reid pointed out, "there's lots of different applications" for the Life Light, including combating the effects of jet lag. What kind of high school has students inventing products that combine smart-home gadgets with durable medical equipment? As you've probably guessed, NuVu isn't your run-of-the-mill school. Founded in 2010 by PhDs and graduates of the Massachusetts Institute of Technology (MIT), NuVu takes an interdisciplinary approach to teaching students in the 10th, 11th, and 12th grades. Students in groups of 12 work in studios, guided by a pair of coaches who guide them through solving large and small real-world problems. There are no conventional classrooms, no courses, and no grades. Reid and her team will continue to work on this project through the next year before she goes off to college in late 2017. She intends to take her project to Kickstarter before entering college, she said, and hopes to offer the Life Light as a retail product by 2018. Why this matters: It doesn't matter how effective a medical treatment is if patients can't bring themselves to participate in it. The conventional treatments for SAD have proven to be highly effective, but who wants to sit in front of a light-box for hours on end? If it makes it to market, the Life Light could improve many people's lives.